Voluntary family planning brings transformational benefits to women, families, communities, and countries. Investing in family planning is a development “best buy” that can accelerate achievement across the 5 Sustainable Development Goal themes of People, Planet, Prosperity, Peace, and Partnership. Accelerating progress in these areas is critical for SDG achievement. We set forth evidence on ways that family planning can influence SDG achievement. At times, the evidence is strong; at other times, less so. Our hope is that the evidence gaps will motivate researchers to address unanswered questions. Most importantly, we hope that the evidence presented here leads to action at the international and country level—to fully support organized, voluntary family planning in the public and private commercial sectors, as well as through civil society. This paper outlines the multiple reasons why investing in family planning is a good decision at every level. It is aligned with recent studies that find that investing in family planning is a development “best buy.”1 Accordingly, we hope that the information presented here will help governments and planners—including Ministries of Finance, district health teams, and civil society organizations—to consider family planning as a fundamental element of any long-term, socioeconomic development strategy, and key to SDG achievement. The international community, however, has made important strides in recent years. The 2010 “Global Strategy for Women’s and Children’s Health” has mobilized new resource commitments, and Family Planning 2020 (FP2020), the UN Commission on Life-Saving Commodities, the MDG Health Alliance, and other groups have revitalized family planning globally. Civil society organizations are highly engaged at local levels to ensure the positive momentum continues. Despite this renewed momentum, family planning investments and service access fall short of need in virtually all low-resource settings. Despite renewed momentum, family planning investments and service access fall short of need in virtually all low-resource settings. Below, we present the SDGs using the organizing principles set forth in the preamble of the Sustainable Development Goals—People, Planet, Prosperity, Peace, and Partnership. (Thus, the SDGs are not always presented in numerical order in this article.) We then synthesize the most recent analyses that document family planning’s importance for the achievement of the SDGs. Family planning affects people in myriad ways. Most fundamentally, it advances human rights. Voluntary family planning helps women and men secure their rights to decide freely, and for themselves, whether, when, and how many children they want to have—a basic human right.3 Family planning supports the rights of the girl child to remain unmarried and childless, until she is physically, psychologically, and economically ready, and desires to bear children. It supports the rights of adolescent boys and girls to information on how rapid, repeat pregnancies will affect their future. It strengthens the rights of women with HIV to decide on future childbearing, free of coercion. Family planning supports the rights of all people to accurate, unbiased information on contraceptive methods that can help them achieve their reproductive preferences. Yet, in many countries, despite possessing these inherent rights, women and girls often bear more children than they want, or at times when they are not planned. In 2012, the year for which the most recent data are available, approximately 85 million pregnancies, representing 40% of all pregnancies globally, were unintended.125 This number was projected to rise to 92 million by 2015.4 In 2014, 225 million women in the developing world had an unmet need for a modern contraceptive method.5 Women with unmet need are defined as those who want to stop or delay childbearing but are not using modern contraceptive methods. In 2012, approximately 85 million pregnancies were unintended. SDG 3.7 supports universal access to sexual and reproductive health care services, including family planning. SDG 5.6 supports universal access to sexual and reproductive rights. Beyond human rights, family planning affects people in other ways, as outlined below. The 2015 UN report of population estimates and projections concludes, “… population growth in the poorest countries will make it harder for those governments to eradicate poverty and inequality … [and] improve the provision of basic services.”10 The challenges for poverty reduction strategies and family planning are clear. This work links to other SDGs related to economic development and poverty reduction, including Goal 8 (decent work and economic growth) and Goal 10 (reduced inequalities). The breastfeeding method of family planning—the Lactational Amenorrhea Method (LAM), considered a modern method of family planning14—yields all of the nutritional benefits of exclusive breastfeeding, and thus can directly influence newborn and infant nutritional status. However, correct use of this method globally is low at 26% of reported LAM users.15 Scaling up correct LAM use globally could bring tremendous nutritional benefits to newborns and infants and prevent unwanted pregnancy among postpartum women for 6 months, before transitioning to another modern method. Family planning helps women time and space their pregnancies to ensure healthy nutritional outcomes. 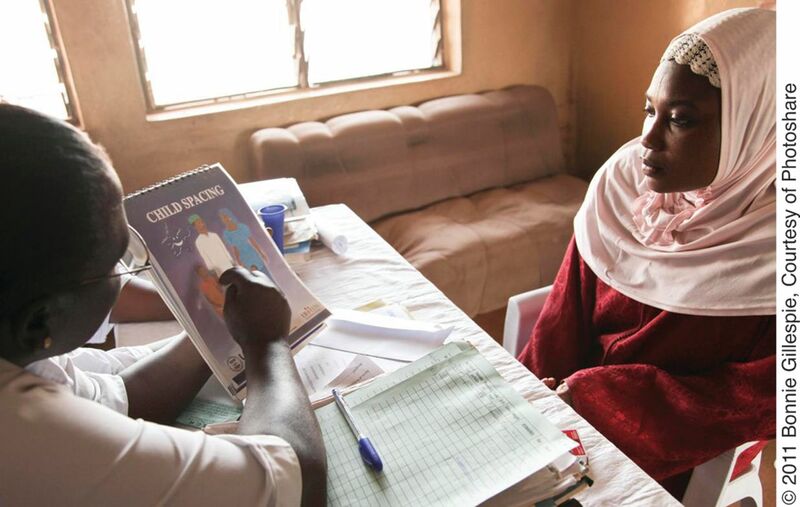 A provider counsels a young woman on birth spacing at a primary health care center in Kagoro, Nigeria. Analyses indicate that, between 2012 and 2020, family planning could help avert approximately 7 million under-5 deaths and prevent 450,000 maternal deaths in 22 priority countries of the U.S. Agency for International Development (USAID).28 A modeling study of 172 countries estimated that, in 2008 alone, family planning averted 272,040 maternal deaths—a 44% reduction compared with the maternal deaths that would have occurred without contraceptive use.29 It also estimated that satisfying unmet need for contraception could prevent another 104,000 maternal deaths per year (an additional 30% reduction). Demographic high-risk pregnancies—pregnancies that occur too early or late in the mother’s age, are too closely spaced, or are considered too many (high parity)—are associated with higher risk of mortality or morbidity. Family planning improves the health of women and children by reducing the proportion of pregnancies that are considered to be high risk. Family planning also reduces the number of women exposed to pregnancy-related health risks, thus lowering the number of unintended pregnancies and births. The healthiest times for a pregnancy are between the ages of 18 and 34 and at least 24 months after a birth (which ensures about 3 years between births), while avoiding more than 4 births. The healthiest times for a pregnancy are between the ages of 18 and 34 and at least 24 months after a birth while avoiding more than 4 births. Family planning helps women bear children at the healthiest times of their lives—when they are psychologically, physically, emotionally, and economically ready for a pregnancy and thus most likely to survive, stay healthy, and have healthy children. Through strengthened, integrated service delivery and improved counseling for women and girls, especially on the risks of short birth intervals,39,40,41 high parity, and advanced maternal-age pregnancies,42 family planning should be playing a larger role in child and maternal survival and in adolescent health and well-being. In an era when approximately 34 million adults and children are living with HIV/AIDS, and women of childbearing age account for nearly half of the infected population, family planning has a critical role to play in curbing the HIV/AIDS epidemic. Family planning has a critical role to play in curbing the HIV/AIDS epidemic. While approximately 1 in 4 women in sub-Saharan Africa has an unmet need for family planning, studies have shown that women living with HIV have higher unmet need for family planning and reproductive health services than the general population, in part due to lack of investment in integrated family planning and HIV services.44 For example, a 2012 study found that programs that have “succeeded in promoting condom use and providing HIV prevention and treatment services … have largely missed the opportunity to address the contraceptive needs of the key populations they serve.”44 Another recent study found that if the needs of women with HIV for modern contraceptive methods and antiretroviral medication were both fully met, HIV transmission from mothers to newborns would be nearly eliminated—reduced by 93% annually,5 greatly contributing to the “AIDS-Free Generation” goal of the U.S. President’s Emergency Plan for AIDS Relief (PEPFAR). Pursuing opportunities to advance family planning integration with HIV services would significantly expand family planning access across Africa and address unmet need. Early and unintended pregnancy can be both a cause and a consequence of dropping out of school. Gender equality and empowerment call for equal access to resources, services, and opportunities. Gender equality refers to equal enjoyment of human rights, goods, opportunities, and services among women and men, while empowerment refers to expanding people’s capacity to make and act on decisions.55 They require addressing the barriers women face in making decisions about their own daily lives.46 Women’s access to their chosen family planning method and their ability to negotiate use of the method, therefore, strongly supports gender equality and empowerment. Women’s access to their chosen family planning method and their ability to negotiate use of the method strongly supports gender equality and empowerment. Many women, however, are unable to make and act on decisions affecting their reproductive lives. A 2014 report found that less than half of currently married women use modern contraception in 37 of 46 countries, and around one-quarter or more of currently married women have an unmet need for family planning in 21 of the 46 countries.46 High levels of unmet need may indicate that women are not empowered to use contraception because they lack access to health care or are unable to negotiate family planning with their partner. Increasing women’s ability to choose the number, timing, and spacing of their children, or their ability to decide if they want to bear children at all, is fundamental for women’s control over the circumstances of their lives and for the full achievement of SDG 5. Family planning has a critical role to play in the planetary health movement. Over the years, population growth has eroded renewable energy gains. A 2013 World Bank report found that although 1.7 billion people gained access to electricity in the last 10 years, “this is only slightly ahead of population growth of 1.6 billion over the same period.”73 Therefore, “the pace of expansion will have to double” to meet the 2030 targets for modern electricity access. Integrated population, health, and environment projects have successfully introduced both family planning and clean energy into communities. The dramatic case of the Sahel demonstrates the important role that family planning can play in helping to create resilient countries and communities. Since 1960, the Sahel, “one of the most chronically vulnerable regions of the world”76 encompassing 10 countries and 100 million inhabitants, has experienced severe drought, food insecurity, low rainfall, environmental degradation, and civil conflict, leading to declining agricultural production. All countries in the Sahel have experienced the “gendered nature of natural disasters.”77 Four of the 10 countries with the highest total fertility rates in the world are in the Sahel (Niger 7.6, Chad 6.5, Burkina Faso 6.0, and Mali 5.9).76 Contraceptive use by married women is extremely low—for example, less than 2% of married women in Chad use contraception. Family planning and lower population growth can help build a more resilient infrastructure for health and economic development. Studies have found that it is “not only rapid population growth, but rapid urbanization that is causing problems for the poorest countries.”80 Estimates indicate that the world is confronting the largest wave of urbanization in human history.81 By 2030, about 5 billion people will live in cities,81 putting huge pressure on infrastructures, such as health, water, sanitation, and education. 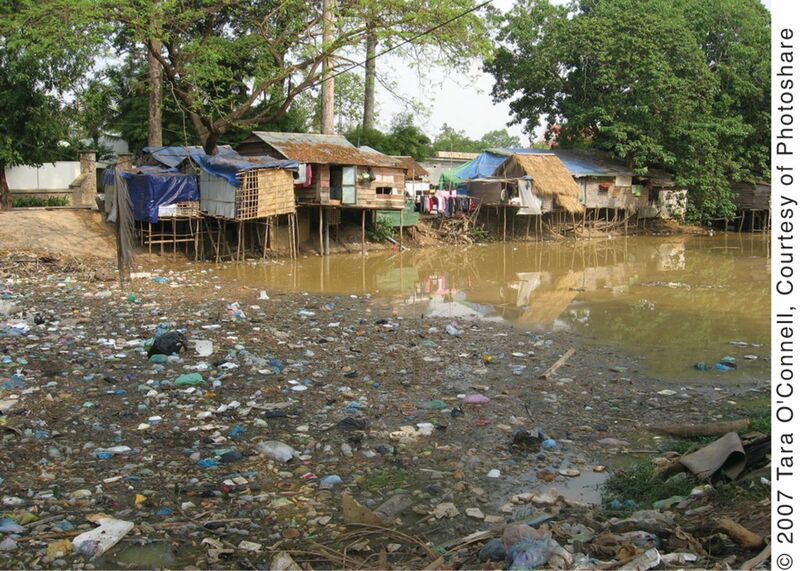 Houses in Cambodia stand on the Siem Reap River, which is clogged with litter and refuse. According to the United Nations Environment Programme, “The well-being of humanity, the environment, and the functioning of the economy, ultimately depend upon the responsible management of the planet’s finite natural resources. These challenges are mounting as the world population is forecast to reach over 9 billion by 2050.”88 Sustainable consumption and production is about managing finite resources and energy efficiency. Key SDG 12 targets involve managing resources efficiently by reducing waste—for example, by 2030, halving per capita food waste, reducing waste generation, and achieving sound management of chemical waste. Improving waste management in low-income countries is an urgent priority. Poor waste management has an enormous impact on health and well-being—contributing to flooding, pollution, respiratory ailments, diarrhea, and dengue fever. Today there are about 3 billion urban residents generating about 1.2 kg of waste per person per day; by 2025, this will increase to 4.3 billion urban residents generating about 1.4 kg of waste per person per day. In lower-income cities, solid waste management is usually the single largest budgetary item. Given the urgency of these issues, studies are needed on the role family planning could play as it relates to urbanization and reduction of food and chemical waste, and the sectoral financial savings that might be generated as a result. Population dynamics have an important connection to both the challenges of and solutions to the problem of climate change. Rapid population growth exacerbates vulnerability to the negative consequences of climate change and exposes growing numbers of people to climate risk. The Intergovernmental Panel on Climate Change (IPCC) considers population (along with economic growth and technical change) “one of the root causes of greenhouse gas emissions.”90 Meeting family planning needs will stem population growth, easing challenges associated with adapting to climate change impacts and reducing the growth of greenhouse gas emissions. A 2015 study on family planning as a cost-effective strategy to address food insecurity and climate change concluded that slowing population growth can “slow global climate change, by providing 16% to 29% of the needed emissions reductions” by 2050 and reduce the need to increase food production.91,92 By the end of the century, the effect of slower population growth could reduce total emissions from fossil fuel use by 37% to 41%. Population dynamics have an important connection to both the challenges of and solutions to the problem of climate change. An analysis found that between 2004 and 2009, in government reports articulating priorities for climate change adaptation, 37 of 40 governments recognized that population growth was important for climate change, yet only 6 proposed activities to address it.96 The analysis called for broad-based adaptation of an integrated approach and gave the example of an integrated watershed management project in Ethiopia in Wichi province that aimed to improve crop production, minimize biodiversity loss, and increase access to family planning and HIV/AIDS awareness. It concluded that governments’ repeated emphasis on the relevance of demographic trends in their climate change adaptation plans “provide a strong collective case for the ‘mainstreaming’ of an integrated approach … exemplified by the Ethiopian case study.” Such a call is still highly relevant today. Under intense population pressure, global fisheries are disappearing and ocean resources are becoming extinct. A 2009 study of global commercial fisheries found that “80% of fish stocks have either been fully exploited, overexploited, or have collapsed.”97 While reducing the catch by 20% to 50% is needed for sustainable fishing, demand for fish is expected to increase by 35 million tons due to increased consumption and population. Of the 21 marine species known to have become extinct in the past 300 years, 16 disappeared since 1972.98 Population growth affects the oceans in many ways including coral reef damage; accidental killing of millions of tons of birds, fish, and sea turtles; runoff laced with massive chemical fertilizer applications creating ocean “dead zones;” and a vast amount of discarded waste of 6.8 billion consumers, which finds its way to the oceans. Population growth will likely impact the success of programs meant to help species rebound and protect the ocean ecosystem. More research is needed on how family planning can support the protection of oceans and marine resources. The world loses approximately 14.5 million hectares of forest each year.99 As populations grow rapidly, the demand for food and forest products also grows, and forest areas are turned into fields for agriculture and commercial forestry. As populations grow rapidly, the demand for food and forest products also grows. A comprehensive study of 46 countries in Africa, Asia, and Latin America found that “agriculture is the main driver of deforestation, causing 73% of all deforestation.”100 Deforestation threatens the well-being and livelihoods of millions of people who heavily depend on forest resources.101,102 Deforestation also contributes to biodiversity loss: it is estimated that the Southeast Asia region, which has the highest relative rates of deforestation, will lose three-quarters of its original forests and up to 42% of its biodiversity by 2100.103 Rapid population growth is a driver of biodiversity loss. Preventing desertification and land degradation is also part of these goals. Desertification occurs with intensive farming, as well as changing climate conditions. Population density contributes to soil depletion and erosion. Providing men and women with family planning to achieve their desires for smaller family sizes will contribute to reduced rates of deforestation, desertification, and land degradation. In the case of the East Asian Tigers (Hong Kong, Singapore, South Korea, and Taiwan), the demographic dividend lasted up to 25 years and has been estimated to account for between 25% to 40% of East Asia’s “economic miracle.”106 Across Africa, estimates suggest that a demographic dividend could raise average incomes by 56% compared with a scenario in which the share of the working age population remains constant.107 The demographic dividend is a window of opportunity for countries to take advantage of a robustly expanding workforce. The payoffs will be high if social and economic policies support the education and employment of young people, especially girls. As a multi-sectoral intervention, family planning also contributes to reaching vulnerable populations, mitigating conflict, and achieving state stability and peace. The poor-rich gap in contraceptive use is diminishing, but gaps remain in many sub-Saharan African countries. These few studies suggest that new research is needed on fertility’s effects on household income and savings. Studies have shown that a large “youth bulge” (defined as a high proportion of youth 15 to 29 years old relative to the older adult population) is associated with a high risk of civil conflict.119 That is, states with youthful age structures—especially within a politically organized minority120—are more likely to experience armed, intrastate conflict and other types of violence. 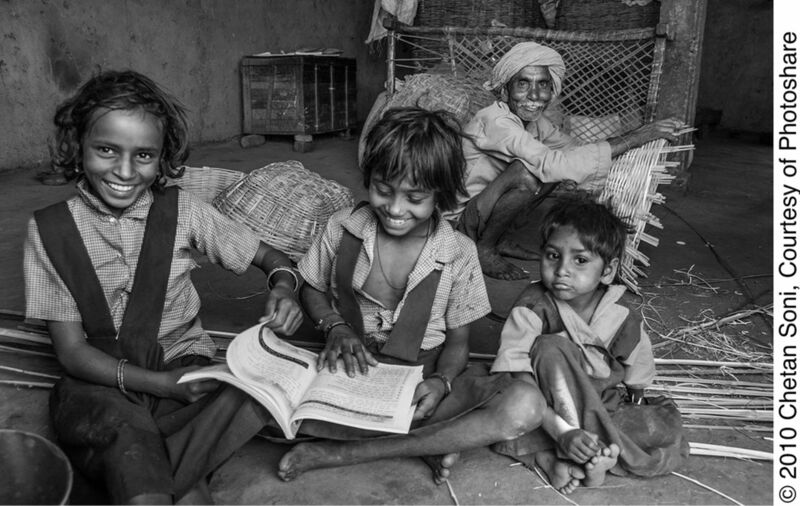 With the help of an NGO in Alirajpur district, India, a father started a basket-weaving business, allowing him to send his girl child to school. For every US$1 invested in family planning, up to US$4 is saved in maternal and newborn health care. A wide range of global partnerships have made important strides in recent years in promoting and strengthening family planning. These partnerships—including FP2020, the UN Commission on Life-Saving Commodities, the Ouagadougou Partnership, and the MDG Health Alliance—provide a foundation and a model for the collaborative, multi-sectoral efforts that are needed to support sustainable development. Moreover, these partnerships will be critical in supporting country-level partnerships that include the public and private commercial sectors, foundations, civil society organizations, and non-health sector groups (e.g., in education, environment, income generation) to accelerate country-level change in the years ahead, and to ultimately achieve the Sustainable Development Goals. In the time frame of the SDGs, the world has the opportunity to achieve a grand convergence between the developed and developing world, ending preventable child and maternal deaths and achieving relative parity in meeting the family planning needs of women, men, couples, and adolescents who want to space or limit childbearing. 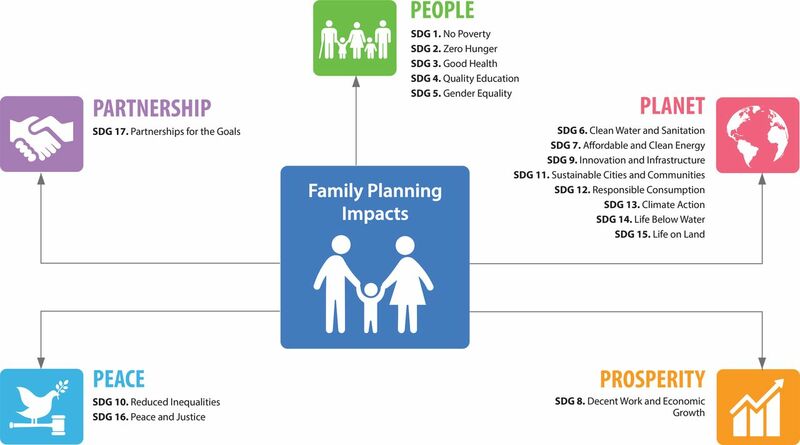 Family planning can accelerate progress across the 5 SDG themes of People, Planet, Prosperity, Peace, and Partnership and is critical to achieving the goals and the post-2015 development agenda (see Box for a summary). Empowering women to choose the number, timing, and spacing of their pregnancies is not only a matter of health and human rights but also touches on many multi-sectoral determinants vital to sustainable development, including women’s education and status in society. Without universal access to family planning and reproductive health, the impact and effectiveness of other interventions will be less, will cost more, and will take longer to achieve. Global strategies and partnerships—and health decision makers at all levels—must leverage the abundance of available research, evidence, and the range of justifications presented here to prioritize family planning as a foundational component of health, rights, and long-term development strategies. Without universal access to family planning and reproductive health, the impact and effectiveness of other interventions will be less, will cost more, and will take longer to achieve. Family planning advances human rights. Family planning helps reduce poverty. Family planning contributes to improved nutrition outcomes. Family planning prevents HIV/AIDS transmission. Family planning supports women’s and girls’ education. Family planning advances gender equality and empowerment. Family planning mitigates population growth’s effects on access to water and sanitation. Integrated population, health, and environment projects can expand access to clean and renewable energy. Family planning contributes to building resilient infrastructures. Family planning contributes to building safe, resilient, sustainable cities. Family planning helps reduce population effects on food and chemical waste. Family planning helps address the challenges of climate change. Family planning helps to protect declining marine resources. Family planning helps mitigate the effects of deforestation and unhealthy interaction among humans, domestic animals, and wildlife. Family planning contributes to economic growth. Family planning promotes inclusive societies by addressing the needs of disadvantaged populations. Family planning contributes to peace and stability. Family planning partnerships can support the achievement of the SDGs. The opinions expressed herein are those of the authors and do not necessarily reflect the views of the U.S. Agency for International Development. This is an open-access article distributed under the terms of the Creative Commons Attribution License, which permits unrestricted use, distribution, and reproduction in any medium, provided the original author and source are properly cited. To view a copy of the license, visit http://creativecommons.org/licenses/by/3.0/. When linking to this article, please use the following permanent link: http://dx.doi.org/10.9745/GHSP-D-15-00374.
. Women’s lives and challenges: equality and empowerment since 2000. 2014 Prepared by ICF International for USAID. Knowledge Management Services Project. Analysis of first, second, and third pregnancies among adolescents in USAID-assisted countries. Washington (DC): John Snow; 2015.
. Egypt: population and development [PowerPoint presentation]. Washington (DC): The Futures Group; [date unknown].
. Climate change, food security, and population in Sub-Saharan Africa: modeling the linkages. Int J Climate Change. 2013;4(2):29–47.
. The age-structural maturity thesis: the impact of the youth bulge on the advent and stability of liberal democracy. In : Goldstone J, Kaufmann E, Toft MD, editors. Political demography: how population changes are reshaping international security and national politics. Oxford (UK): Oxford University Press; 2012. p. 98–116.
. Demography as early warning: gauging future political transitions in the age-structural time domain. J Intelligence Analysis. 2015;22(2):129–148.